Luton Town Football Club is a professional association football club based in the town of Luton, Bedfordshire, England, that competes in League One, the third tier of the English football league system. Founded in 1885, it is nicknamed "the Hatters" and affiliated to the Bedfordshire County Football Association. The team plays its home matches at Kenilworth Road, where it has been based since 1905. The club's history includes major trophy wins, several financial crises, numerous promotions and relegations, and some spells of sustained success. It was perhaps most prominent between 1982 and 1992, when it was a member of English football's top division, at that time the First Division; the team won its only major honour, the Football League Cup, in 1988. 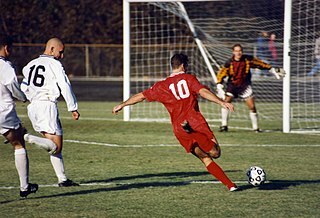 In several team sports, matches are played in two halves. Half-time is the name given to the interval between the two halves of the match. 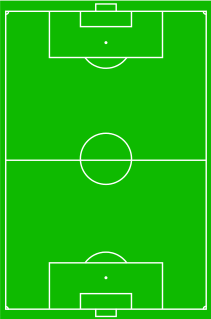 Typically, after half-time teams swap ends of the field of play, in order to reduce any advantage that may be gained from wind or a slope to the playing surface, for example. In association football, a substitute is a player who is brought on to the pitch during a match in exchange for an existing player. Substitutions are generally made to replace a player who has become tired or injured, or who is performing poorly, or for tactical reasons. Unlike some sports, a player who has been substituted during a match may take no further part in it. Joseph Patrick Kinnear is an Irish former football manager and player. Kinnear played as a defender, spending the majority of his career—ten seasons—with Tottenham Hotspur. With Tottenham he won the FA Cup, the Football League Cup twice, the FA Community Shield and the UEFA Cup. Kinnear was born in Dublin, moving to Watford, England at the age of seven. He was capped 26 times for the Republic of Ireland national football team. Following the end of his playing career he has also been the manager of India, Nepal, Doncaster Rovers, Wimbledon, Luton Town, Nottingham Forest and Newcastle United. Kevin Patrick Blackwell is an English former professional football goalkeeper who since retiring as a player has worked as a coach and a manager, and is currently assistant manager at Cardiff City. Union Royale Belge des Sociétés de Football Association ASBL v Jean-Marc Bosman (1995) C-415/93 is a 1995 European Court of Justice decision concerning freedom of movement for workers, freedom of association, and direct effect of article 39 of the TEC. The case was an important decision on the free movement of labour and had a profound effect on the transfers of footballers within the European Union (EU). 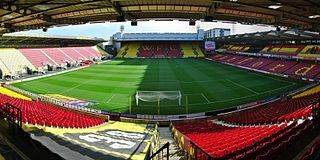 Vicarage Road, a stadium in Watford, Hertfordshire, England, is the home of the football club Watford of the Premier League. An all-seater stadium, its current capacity is 23,700 following the completion of the new Sir Elton John Stand in 2014, and expansion work in 2015 and again throughout 2016 and 2017; this included expansion of the football pitch. Damien Jerome Francis is a retired Jamaican international footballer who played as a defensive midfielder. 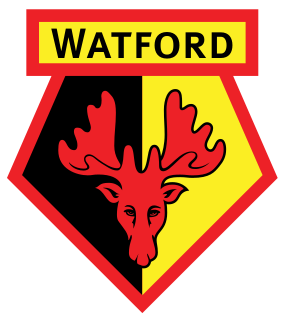 During the 2006–07 English football season, Watford competed in the FA Premier League, after being promoted from the Football League Championship last season. During the 2007–08 English football season, Luton Town competed in League One. Wayne Michael Hill Andrews is an English former footballer who played as a forward in the Football League for a number of clubs, most notably for Watford, Oldham Athletic, Colchester United, Crystal Palace, Coventry City and Luton Town, and also appeared for several clubs on loan. He is of Barbadian descent. Samuel Parkin is an English former footballer; a radio presenter for BBC Wiltshire, regularly involved with Swindon Town's coverage; and commentator for Chelsea TV. Throughout his career Parkin has played as forward for Chelsea, Millwall, Wycombe Wanderers, Oldham Athletic, Northampton Town, Swindon Town, Ipswich Town, Luton Town, Leyton Orient, Walsall, St Johnstone, Queen of the South, St Mirren, and most recently Exeter City in League Two. Alan Desmond Lee is an Irish former footballer who played as a striker; he is now working as an academy coach at Ipswich Town. He scored 119 goals in 547 appearances in a 19-year professional career in the Football League, and won 10 caps for the Republic of Ireland. Scott David Rendell is an English footballer who plays as a striker for Aldershot Town. Lloyd Colin Doyley is a professional footballer who plays as a defender for National League South club Billericay Town. Darius Alexis Henderson is an English professional footballer who last played as a striker for Eastleigh. Alan Michael Anthony Sheehan is an Irish professional footballer who plays as a defender for League One club Luton Town. He played for the Republic of Ireland national under-21 team. Lionel Glenn Robert Ainsworth is an English footballer who plays for Plymouth Argyle as a right winger. He has previously played for multiple Football League and non-league clubs as well as in the Scottish Premiership. He was capped at youth level by England. Dominic John Blizzard is an English actor, and former professional footballer who played as a midfielder. Paul Andrew Benson is an English semi-professional footballer and coach who plays as a striker for Southern League Division One Central club Bedford Town. Daniel Thomas Hylton is an English professional footballer who plays as a striker for League One club Luton Town. Marlon Pack is an English professional footballer who plays as a midfielder for Bristol City. He formerly played for Portsmouth and Cheltenham Town. Andre Anthony Gray is an English professional footballer who plays as a striker for Premier League club Watford. Luke David Gambin is a professional footballer who plays as a winger for League Two club Crawley Town, on loan from League One club Luton Town, and the Malta national team. Lee Anthony Angol is an English professional footballer who plays as a striker for Lincoln City of League Two, on loan from League One club Shrewsbury Town. Adebayo Linford Kazim "Ade" Azeez is an English professional footballer who plays as a striker for League Two club Newport County. He began his career with Charlton Athletic, spending time on loan to Wycombe Wanderers, Leyton Orient, Torquay United and Dagenham & Redbridge before being released in 2014. He then played for AFC Wimbledon before signing for Partick Thistle in 2016. He has represented the England under-19 team. Joseph David Wozencroft Pigott is an English professional footballer who plays as a striker for League One club AFC Wimbledon. Alfie Robert John Mawson is an English professional footballer who plays as a centre back for Premier League club Fulham. 1 2 3 Hugman, Barry J., ed. (2010). The PFA Footballers' Who's Who 2010–11. Edinburgh: Mainstream Publishing. p. 390. ISBN 978-1-84596-601-0. 1 2 3 "Games played by Matthew Spring in 1997/1998". Soccerbase. Centurycomm. Retrieved 26 February 2016. 1 2 "Games played by Matthew Spring in 1998/1999". Soccerbase. Centurycomm. Retrieved 26 February 2016. 1 2 "Games played by Matthew Spring in 2000/2001". Soccerbase. Centurycomm. Retrieved 26 February 2016. ↑ "Luton 0–1 Rotherham". BBC Sport. 24 April 2001. Retrieved 27 March 2016. 1 2 3 "Games played by Matthew Spring in 2001/2002". Soccerbase. Centurycomm. Retrieved 26 February 2016. 1 2 "Games played by Matthew Spring in 2003/2004". Soccerbase. Centurycomm. Retrieved 26 February 2016. ↑ Pearson, James. "Hatters resigned to Spring exit". Sky Sports. Retrieved 27 March 2016. ↑ "Matthew Spring". Soccerbase. Centurycomm. Retrieved 4 October 2016. 1 2 3 "Leeds sign Spring". BBC Sport. 1 July 2004. Retrieved 27 March 2016. 1 2 "Games played by Matthew Spring in 2004/2005". Soccerbase. Centurycomm. Retrieved 26 February 2016. ↑ "Leeds' Spring makes Watford move". BBC Sport. 19 August 2005. Retrieved 27 March 2016. ↑ "Watford 3–1 Burnley". BBC Sport. 20 August 2005. Retrieved 27 March 2016. 1 2 "Games played by Matthew Spring in 2005/2006". Soccerbase. Centurycomm. Retrieved 26 February 2016. ↑ "Crystal Palace 0–3 Watford". BBC Sport. 6 May 2006. Retrieved 27 March 2016. 1 2 "Leeds 0–3 Watford". BBC Sport. 21 May 2006. Retrieved 27 March 2016. 1 2 3 4 "Games played by Matthew Spring in 2006/2007". Soccerbase. Centurycomm. Retrieved 26 February 2016. ↑ "Watford man Spring rejoins Luton". BBC Sport. 18 January 2007. Retrieved 27 March 2016. ↑ "Coventry 1–0 Luton". BBC Sport. 30 January 2007. Retrieved 27 March 2016. ↑ "Derby 1–0 Luton". BBC Sport. 20 April 2007. Retrieved 27 March 2016. 1 2 "Games played by Matthew Spring in 2007/2008". Soccerbase. Centurycomm. Retrieved 26 February 2016. ↑ "Luton 1–2 Brighton". BBC Sport. 12 April 2008. Retrieved 27 March 2016. ↑ "Blades on verge of triple swoop". BBC Sport. 31 July 2008. Retrieved 27 March 2016. ↑ "Sheff Utd 3–1 Port Vale". BBC Sport. 13 August 2008. Retrieved 16 August 2008. ↑ "Spring's goal consolation". Sheffield United F.C. 26 November 2008. Archived from the original on 18 February 2012. ↑ "Spring loan finished". Sheffield United F.C. 9 January 2009. Archived from the original on 18 February 2012. ↑ "Spring seals Addicks move". Sky Sports. 9 January 2009. Retrieved 27 March 2016. ↑ "Sheff Wed 4–1 Charlton". BBC Sport. 17 January 2009. Retrieved 12 April 2010. ↑ "Charlton 1–0 Crystal Palace". BBC Sport. 27 January 2009. Retrieved 12 April 2010. 1 2 3 "Games played by Matthew Spring in 2008/2009". Soccerbase. Centurycomm. Retrieved 26 February 2016. ↑ "Charlton 2–2 Blackpool". BBC Sport. 10 April 2009. Retrieved 27 March 2016. 1 2 "Games played by Matthew Spring in 2009/2010". Soccerbase. Centurycomm. Retrieved 26 February 2016. ↑ "Charlton release six players with more set to follow". BBC Sport. 24 May 2010. Retrieved 27 March 2016. ↑ "Orient bring in Spring". Sky Sports. 30 June 2010. Retrieved 27 March 2016. ↑ "Yeovil 2–1 Leyton Orient". BBC Sport. 7 August 2010. Retrieved 27 March 2016. ↑ "Notts County 3–2 Leyton Orient". BBC Sport. 18 September 2010. Retrieved 27 March 2016. 1 2 "Games played by Matthew Spring in 2010/2011". Soccerbase. Centurycomm. Retrieved 26 February 2016. ↑ "Leyton Orient 3–0 Bromley". BBC Sport. 12 November 2011. Retrieved 27 March 2016. ↑ "O's Spring a big surprise". Sky Sports. 31 December 2011. Retrieved 27 March 2016. 1 2 "Games played by Matthew Spring in 2011/2012". Soccerbase. Centurycomm. Retrieved 26 February 2016. ↑ Bass, Matt (2 July 2012). "Spring joins Chairboys". Guardian Series. Walthamstow. Retrieved 1 May 2013. 1 2 "Gary Doherty & Matthew Spring head five Wycombe signings". BBC Sport. 3 July 2012. Retrieved 27 March 2016. 1 2 3 "Games played by Matthew Spring in 2012/2013". Soccerbase. Centurycomm. Retrieved 26 February 2016. ↑ "Crewe 4–1 Wycombe". BBC Sport. 3 November 2012. Retrieved 27 March 2016. 1 2 "Games played by Matthew Spring in 2013/2014". Soccerbase. Centurycomm. Retrieved 26 February 2016. ↑ "Wycombe Wanderers release Leon Johnson and eight others". BBC Sport. 14 May 2014. Retrieved 27 March 2016. ↑ "St Neots Town FC First Team". St Neots Town F.C. Archived from the original on 24 December 2014. ↑ Plummer, Mark (16 May 2015). "Four shown the St Neots Town door". The Hunts Post. Retrieved 31 March 2018. ↑ "Frendo signs from the Saints as Tudors rebuild for next season". Hemel Today. 3 June 2015. Retrieved 31 March 2018. ↑ "Hitchin Town 2 Cirencester Town 1". Hitchin Town F.C. 6 March 2017. Retrieved 7 March 2017. ↑ Whitney, Steve (23 March 2018). "Spring comes to Hitchin". Pitchero Non-League. Retrieved 31 March 2018. ↑ "One rejoins permanently and another departs". Hitchin Town F.C. 24 May 2018. Retrieved 5 August 2018. ↑ "Watford 1–2 Luton". BBC Sport. 10 September 2002. Retrieved 27 March 2016. ↑ "Games played by Matthew Spring in 1999/2000". Soccerbase. Centurycomm. Retrieved 26 February 2016. ↑ "Games played by Matthew Spring in 2002/2003". Soccerbase. Centurycomm. Retrieved 26 February 2016. 1 2 3 4 5 6 "Player profiles: Matthew Spring". Aylesbury United F.C. Retrieved 11 December 2018. ↑ "Whitehawk vs. Hemel Hempstead Town". Soccerway. Perform Group. Retrieved 31 March 2018. ↑ "M. Spring: Summary". Soccerway. Perform Group. Retrieved 5 August 2018. ↑ "Kings Langley vs Hitchin Town". Hitchin Town F.C. 2 April 2018. Retrieved 5 August 2018. ↑ "Football League Third Division: 2001/02: Latest table". Soccerbase. Centurycomm. Retrieved 31 March 2018. ↑ "Leeds United F.C. History". ozwhitelufc.net.au. Retrieved 27 March 2016.